Designed to give the reader the insight of a data storage administrator, this book covers data storage from top to bottom, inside and out. Starting with the basics, right through to advanced topics, advice and real-world examples, enabling the reader to understand why and how to deliver world-class solutions in real-world environments. 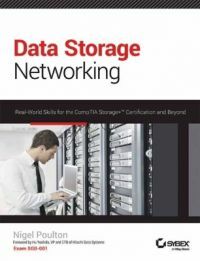 The book focuses on designing, implementing and administering storage for today's evolving organizations, getting under the hood of the technologies that enable performance, resiliency, availability, recoverability and simplicity. Nigel Poulton is a well-known storage blogger and podcaster, known for his love of storage and deep technical knowledge. He has 15 years IT experience, the last 10 working on data storage. He is currently a storage architect for large global financial organization, working in the Global Storage Strategy & Architecture team. Nigel has done just about everything the storage industry has to offer, all the way from changing backup tapes and plugging in cables, to writing complicated design and architecture documents for petabyte scale environments.